Thank you Mark and MVP for organizing this 3 day fantastic event. I aquired my 996 GT3 in early December and after taking it out a couple of times I realized that the GT3 is a much different car than my 997 4S. More track time was needed. Therefore my preparations started 3 weeks ago at an event at TWS (Texas World Speedway). The sun had returned to Texas and we were blessed with sunny skies and 60F weather. I hired a coach for a day and Dave gave great instruction on how to drive the car, ie read the track, use throttle to rotate car (much different than a 4S as it will pull more in a corner with the front wheels driving), etc etc. At TWS I was still running on the Hankook V12 tires and stock pad. The alignment was changed but that was the only modifications to the car; neg 1.9 (max without rotating struts), no toe in front, and -0.2 in the rear, sway bars set. I had two days of great running at TWS and became more and more comfortable with the car. In this set up it will slide the rear and allow me to catch it without to much drama. After TWS the car went in the shop for oil change, coolant flush to replace glycol with Water Wetter, new tires (AD08), Padgid pads, new Cayenne S rotors, and a few other items. Two weeks ago I attended a great weekend with Drivers Edge at MSR Houston. My lap times at MSR Houston with the 4S was 2min. The first day with the GT3 1I saw 1:55 and on second day 1:51 lap times. Great improvements and thanks to the Drivers Edge program. The car ran great in the afternoon and the times came down to around 2:46 per lap. Saturday morning the car continue to run great with no more oil leaks. I steadily improved my times and in the last session of the day I did my best lap; 2:40. I tried to go faster Sunday but could not beat it. However, I did have several consistant laps around 2:41-43. 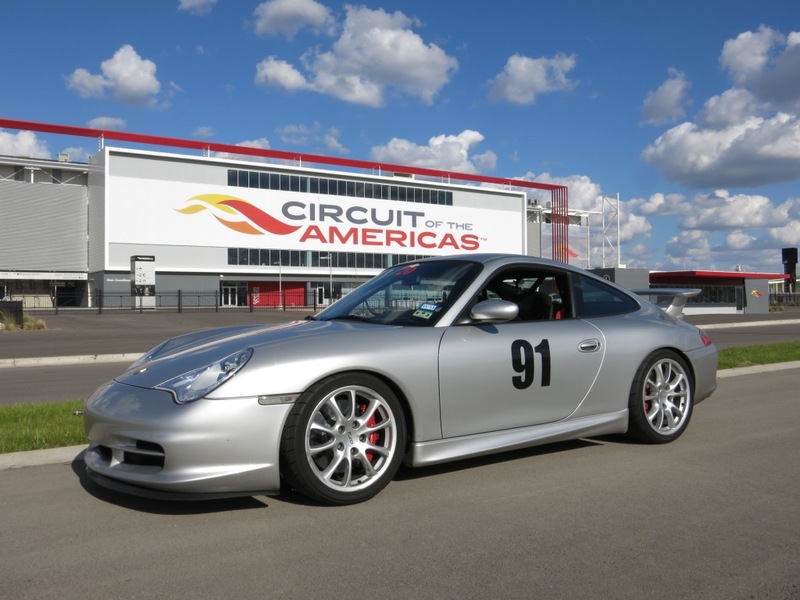 I am very pleased with my car, how it performed, the COTA track and the experience this past weekend. To much fun. To put icing on the cake, Friday morning a gentleman had an extra garage and offered it to anybody interested. My friends and I grabbed it. The gentleman that offered it for sale drove a 2005 997 Supercup car, very desirable collectors car. He had hired Shane Lewis as his coach. Mr Lewis just won Daytona and Dubai 24 hrs Rolex. So now we are at COTA driving the newest F1 track and we are sharing the garage with Shane Lewis. Could not get any better. See my YouTube film below. Last edited by tgavem; 02-05-2013 at 10:45 AM. Great story, that's what life is about. Way cool! Glad your oil filter problem was resolved. You should come out to TWS this weekend. I'll be there again with the blue Cayman R.
Going skiing this weekend but will try and make TWS on my birthday, March 9th. Hope to see you then. Sounds like an awesome weekend, wish I could have been there. Good job Tor. Glad you are enjoying the car and what a great track to put it on! I cant wait until my next opportunity to go back to COTA. Will 245's Fit on 8.5" Front Wheels?